Don’t let these issues lead to bigger and more expensive problems later on. Have you ever encountered a “red flag” inside your home or on your property and simply ignored it? Something like a running toilet, leaking faucet, or your washing machine that sounds like an engine taking off? Or maybe that dead tree on your property that your neighbor keeps asking you to take down? Just like pulling a thread, these small-ish issues with your home could eventually lead to major issues like a broken appliance, damaged flooring, or worse. When these red flags pop up, it’s a smart idea to take notice and do a quick assessment: is this something you can easily fix yourself or should you call in a pro? Is this an expensive fix that you should save up for or an inexpensive part replacement? Obviously, the quick or inexpensive fixes should be addressed, but larger issues may require a consultation with a pro and possibly a larger financial decision. Here are some typical red flags that you shouldn’t ignore. Your roof is a very important part of the structural integrity of your house. Without it, the elements can quickly damage your house. It’s important to fix broken or missing shingles as well as the underlayment of the roof. If damage is noticeable, or if you feel soft spots when walking on your roof, call in a professionalzfbzcuyqsybrvyararsyawfcfawwursr. Sometimes actual damage isn’t very noticeable to untrained eyes, and simply repairing one area of the roof may not properly address other issues. Roofing professionals can advise if the problem with the roof is being caused by other factors such as nearby trees or broken gutters. Gutters and downspouts are designed to direct water from the roof away from the home, so large puddles may indicate that the gutters aren’t functioning properly. If these puddles happen regularly there could be an issue with the joints in your gutters or it could indicate clogged gutters. Gutters need to be regularly cleaned and if you notice obvious leaks or broken joints, fix them. Too much water near the home’s foundation can lead to issues, especially if your foundation is in poor condition. Consider consulting a general contractor or a gutter cleaning specialist. This may seem like an obvious issue to fix but many homeowners simply don’t look at their foundation. It’s not a bad idea to walk around your home’s foundation once a year and inspect it for cracks. Do this on the outside as well as the inside (if you have access). Hairline cracks (less than 1.5mm) are fairly common and aren’t usually an issue. But if they increase or become larger, you’ll want to fill them in or possibly seek help from a foundation expert. To measure cracks over time, use a tape measure and mark the distance on either side of the crack with a pencil or chalk. Over time, you can re-measure this distance and see if it has spread apart further. Water damage inside the home is often the result of leaks, either from a source inside the home (like a damaged pipe) or a source outside the home (like rain water). Some water damage is easy to spot and other times the damage might be concealed between walls or in the attic. If you suspect a water leak, either from a dripping source or from a more expensive than normal water bill, you’ll want to fix it right away. If you suspect water damage from your roof, overflowed bathtub or other one-time incident, you’ll also want to inspect the drywall or plywood and see if it needs to be replaced. Wet, water-soaked walls can breed mold or mildew, which may be dangerous to your health. If you don’t know where the problem is coming from, or if you suspect your pipes need more work than you can do on your own, don’t hesitate to call in a plumber. If you notice zero leaves on a tree and it’s the middle of summer, it may be dead. It’s not always obvious if a tree is diseased or dead, especially if the trunk looks normal. An arborist should be consulted regarding the health of your trees; they can also determine if the whole tree needs to come down or just some of the branches. 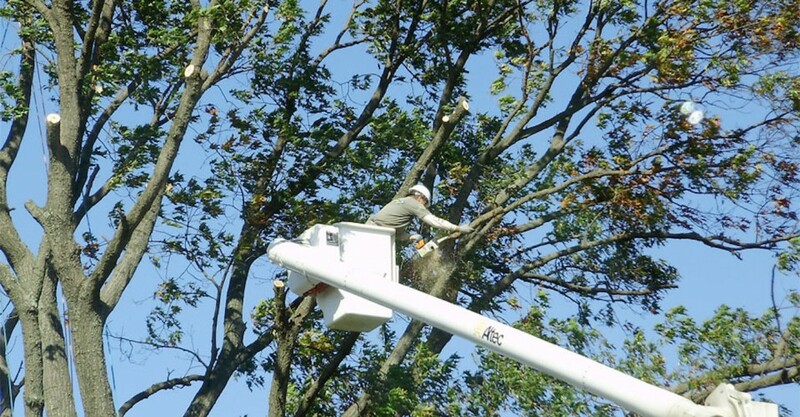 Even healthy trees may need a limb trim from time to time. Branches may look harmless from the ground, but their weight could do serious damage to your roof, property, or people. Dangling branches should definitely be attended to and removed, especially before seasonal windstorms. If your tree branches fall and cause damage to your neighbor’s property, you could be held liable. Call in a tree expert or landscaper. Properly maintained, a newer oil tank should last about 10-15 years. Leaks from a residential oil tank can wreak havoc on the local environment and cost thousands of dollars to clean up. So it’s important that homeowners have their oil tanks regularly inspected by a professional. It may be easy to spot a leak from an above ground oil tanks, but ones that are buried may be difficult to inspect. Even if you don’t use an oil tank on your property, it is your responsibility to ensure that it is properly maintained and not leaking. The EPA estimates that 10% – 20% of residential septic tanks fail each year, causing harm to the property and environment as well as a risk to human health. If you own a septic tank you’ll need to understand how to create a healthy environment for the septic system as well as have it regularly maintained and inspected by a professional. Many septic tank issues are user-related, meaning they are usually preventable. And the cost of regular maintenance is far less than the cost of repair or replacement. If you notice warning signs of a malfunctioning septic tank like bubbling noises from sinks, showers or toilets, or backing up of these systems, call a professional. Your home’s water use may have seasonal changes, like when you irrigate your lawn in the summer, or if you’ve been out of town for a few weeks in a row. But major changes to your normal water bills should be indication that there may be a leak. Even slow leaks, like a dripping faucet, can add up to huge amounts of wasted water each year. During the warmer months, broken sprinkler heads or leaking faucets can create a much larger water bill than you should have. It’s a good idea to fix obvious water wasters in and around your home and replace older fixtures like toilets or washing machine hoses. If you don’t know where to begin with this process or are unsure of your plumbing skills, be sure to hire a professional.